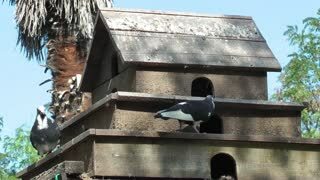 Image of pigeon house at public park, Stuttgart, Germany. 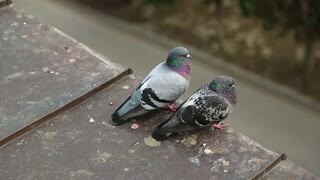 A house pigeon with lilac plumage sits on a fence. Pigeon turns his head and looks around. Beautiful bokeh in the background. Slow motion shot of waves near Pigeon Point Light House in Pescadero, California. Pigeon Point Light House in Pescadero, California. Wooden Dovecote with a roof against a blue sky. A house for pigeons in the garden as a nest for birds.